The ultimate chefs kitchen with a commanding view of the distant hills from every room. Elegant entry with stone patio, 3 car garage, 3 fireplaces, 4 bedrooms and 3 baths. 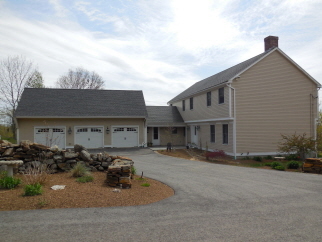 Desirable Tower Hill is a lovely country road only 15 minutes from the Mass Pike in Sturbridge or Palmer. Come to the country! Open floor plan with 3 fireplaces! Updated kitchen with vaulted ceiling, wide pine floor, solid surface counters and is fully applianced. Spacious family room, living room with built-ins and elegant entry! New 3 car garage with the ultimate work shop area, includes 2nd floor walk-up attic, room for all your storage needs! Wraparound decks, established gardens and new paved drive! Walk-in pantry, master suite includes a private balcony with serene mountain views!